Burundi: How fragile is Burundi's peace? BUGESERA, Rwanda, 22 April 2015 (IRIN) - The number of Burundians who have fled abroad to escape pre-election violence has swollen to more than 12,000 in less than a month, and they are taking with them allegations of murder, torture and intimidation by ruling party thugs. A 13-year civil war between 1993 and 2005 claimed an estimated 300,000 lives. International alarm bells are ringing, amid fears that the fragile peace could unravel over President Pierre Nkurunziza’s presumed bid for a third term, which many see as unconstitutional. 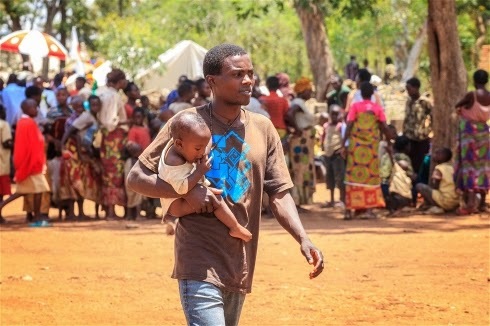 But this “climate of fear and instability” has already caused many to flee: 9,521 to Rwanda and 2,740 to the Democratic Republic of Congo, according to the latest count by the UN refugee agency, UNHCR. IRIN spoke to several refugees after they entered Rwanda. Many said they had fled for fear of the Imbonerakure, the youth wing of the president’s party, widely described as a militia and a law unto itself. Dieudonne, a 36-year-old mechanic, said his family members had been targeted because they were known supporters of Hussein Radjabu, a political rival of the president’s who was sprung from jail in March. Dieudonne said the militiamen claimed to have killed before and threatened to kill them if they didn’t support Nkurunziza. He decided not to hang around and took his family to Rwanda for safety. The government denies arming the Imbonerakure. What chance of free and fair elections? Sixty-five people who took part in a demonstration last week to protest against Nkurunziza’s plans to run for a third term have been charged with insurrection. If convicted, they face up to 10 years in jail. In its latest report on Burundi, the International Crisis Group warned that it is increasingly unlikely that the local, parliamentary and presidential elections will be free and fair. A “return to violence would not only end the peace that was gradually restored after the 2000 Arusha [Peace and Reconciliation] Accord, but would also have destabilising regional implications and would mark a new failure in peacebuilding policies,” the report warned. The refugees, however, told a different story. The 34-year-old farmer said they were later told that his brother had been shot dead while attempting a robbery. “We have looked for his body in all police stations, without luck. The Imbonerakure have also warned my family several times that they will kill us because we are Tutsis,” he said. Augustin, a 40-year-old shop assistant who had sought refuge in Rwanda with his wife and three children, said his father had been killed simply for belonging to a rival political party. Charlotte’s husband disappeared after being arrested in connection with a mysterious five-day border battle over new year in Cibitoke province that left around 100 people dead. “My husband was accused of working with the rebels and was taken to unknown destination. I tried to follow his case but I was warned by Imbonerakure to drop the matter for my life’s sake,” the 26-year-old teacher told IRIN. “Even those not in politics. They keep an eye on them day and night, and we fear for our safety. Night meetings involving our local leaders are taking place and we don’t know what is being discussed and planned,” she said. Burundi’s civil war was fought along ethnic lines, and the essence of the 2000 peace and reconciliation accord was to ensure, through a quota system, a balance of power between the long dominant Tutsi and the Hutu majority, which makes up 85 percent of the population. Recent years have delivered significant reconciliation and Burundi’s political fault lines are less defined in Hutu-Tutsi terms than they used to be, with the fulcrum of tension being whether Nkurunziza should be allowed to run again. Ruth, a 30-year-old mother-of-two, said the president must give up power because he had become an "obstacle" that was preventing the investigation of widespread abuses by the army and the police. “I think this will be fair to Burundians, as they seek justice,” she said.